The Arrowood 2 Mid WP is the mid-height boot version of Teva’s lightweight shoe of the same name. The boot uses a combination of leather in the lower section with a padded ankle extension in contrasting colour. 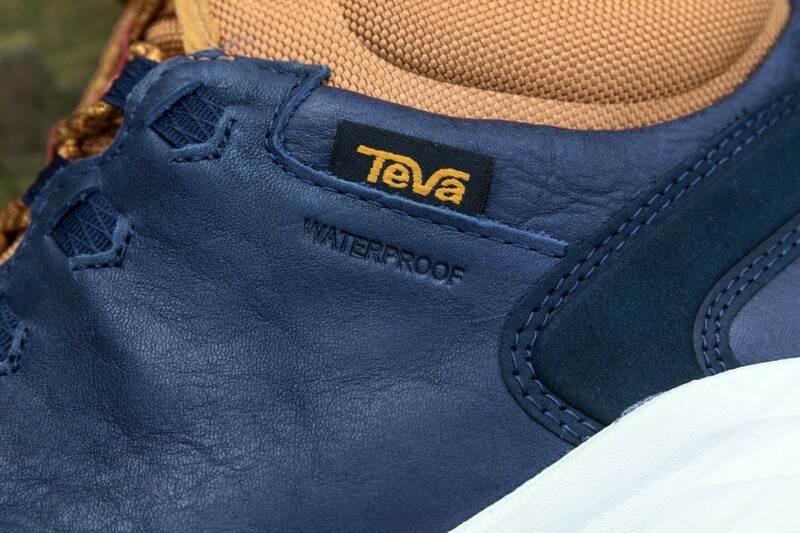 On our pair of Teva boots, the main body of the boot was navy blue, with a tan upper section. The boot is comfortable and stylish enough to be worn round town for everyday purposes, yet with enough technical features to make it suitable for walks on moderate trails. The WP denotes the boots have a waterproof membrane, and during testing the Arrowood 2 Mids kept our feet dry both on rainy urban outings and on the trails we use for testing. The outsole is designed with a triangular lug pattern in two different materials, one harder at the heel, forefoot and toe section, and a softer one in the midfoot and a couple of small areas near the toe. The harder insets are in places subject to more wear and also provide better traction and braking. 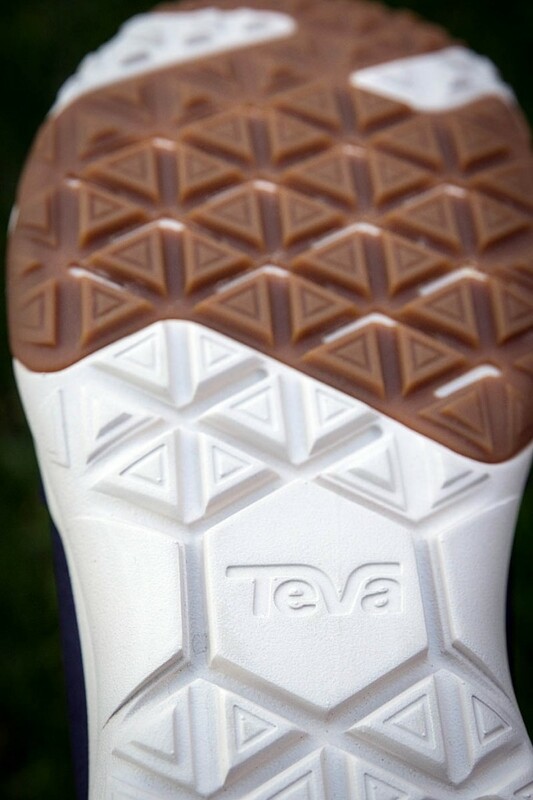 The midsole is Teva’s FloatLite and this provided good support and lots of underfoot cushioning. 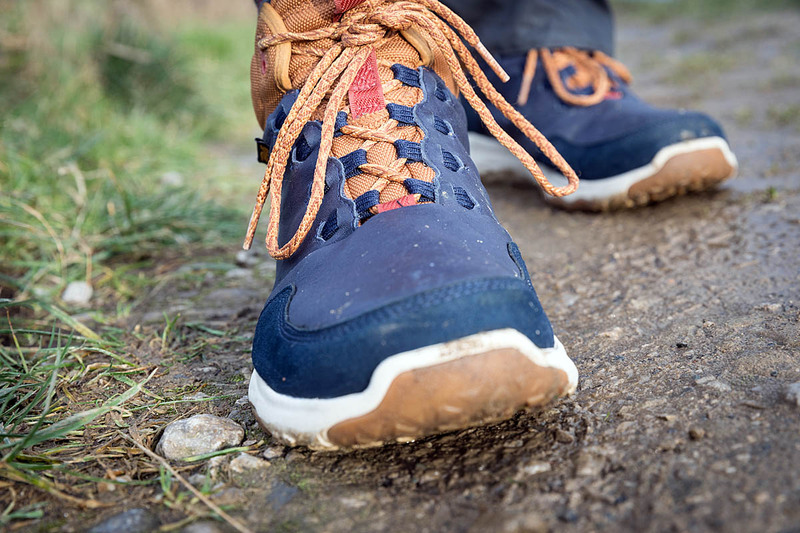 The soles are very flexible, so aren’t really suitable for off-path excursions or rocky mountain terrain, but worked well on maintained paths on trails. The insole has a supportive heel cup that kept the foot in place, and has arch support. It also provides a little extra underfoot cushioning. The Arrowood 2 Mid boot had good adhesion on trails and grass in the dry, but was a little less assured on wet surfaces. The uppers are supple but supportive. There’s an additional suede section at the toe section and also at the heel section. A rigid heel cup protects that area of the foot and aids stability. The soft outsole section extends upwards to form the outer of the midsole. Lacing is via four pairs of webbing loops with a final pair of dual-position eyelets on the ankle cuff. The laces locked in position quite well, enabling the boot to be pulled snug around the foot. The ankle cuff and tongue both have good padding and there are webbing loops on both the tongue and back of the ankle to help pull the boots on – quite useful in this boot version of the Arrowood 2. The boots, with their waterproof membrane, felt quite warm – useful in cooler months but perhaps less welcome in summer weather. One of the great aspects of the Arrowood 2 Mid WP is its lightness. A pair of size 10 boots tipped our scales at the equivalent of less than 1¾lbs, and the low weight and supple comfort, combined with good underfoot padding, made for a pleasant walking experience when on longer trails. 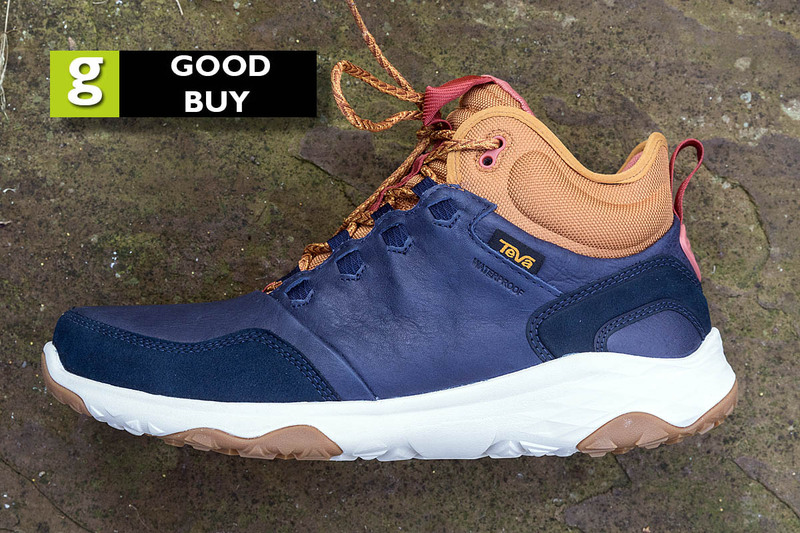 Though designed with plenty of technical features, the Teva boots don’t shout ‘outdoors’, something remarked upon by non-outdoorsy types who appreciated the Arrowood 2’s looks. We found the Teva boots great for everyday wear, with the convenience of knowing that, if we wanted to then hit the trail, the footwear would be up to the task. The higher design of the Mids gave extra protection from rain and puddle splashes, again ensuring a dry outing. They won’t be your choice for munrobagging, but as a day-to-day boot combining street style with technical performance, they’re a good pick. The Arrowood 2 Mid WP boots were supplied to grough by Teva.